To analyze Tesla Motors with the help of Warren Buffett (no introduction needed), we are going to use the book Money Masters of Our Time by John Train. Buffett has never written a book about how he invests in companies. So we have to trust someone who has analyzed the shorter writings by Buffett and has summarized the findings. Elon Musk, the CEO of Tesla Motors, admires Buffett. The Giving Pledge is a philanthropic campaign by Buffett and Bill Gates, and Elon is one of twelve billionaires who has signed it and will give at least half of his wealth to charity. Although value investing has taken many forms since its inception, it generally involves buying securities that appear under priced by some form of fundamental analysis. As examples, such securities may be stock in public companies that trade at discounts to book value or tangible book value, have high dividend yields, have low price-to-earning multiples or have low price-to-book ratios. All we want is to be in businesses that we understand, run by people whom we like, and priced attractively relative to their future prospects. The 83 years old Buffett is still an active investor, so the short answer to the question if he would like to invest in Tesla is: No! (Because he hasn't invested in Tesla). But that doesn't mean Tesla is a bad company from an investing point of view. We will see that Buffett's analysis depends on a series of question. The answers to these questions depends on the investor itself. According to the book, there are a number of characteristics of a wonderful business Buffett prefers to invest in. Notice that I will use Coca Cola to make an example. One interesting side note here is that one of the reasons Elon Musk's grandfather decided to move from Canada to South Africa was because he had received death threats from what he believed was Coca Cola. So without Coca Cola, there wouldn't have been an Elon Musk, because his father is South African, and no Tesla Motors. They are understandable. Do you understand the company? To test if a business is understandable, Buffett closes his eyes and tries to visualize how the company will look like ten years hence. Compared with a company like Coca Cola, it's more difficult to understand Tesla. You have to understand the car industry and why we need cars not powered by oil. How will Tesla look like in 10 years? How many cars will they sell? How much money will they need to sell those cars? They see their profits in cash. The company shouldn't have to reinvest all profits just to stay in business. Tesla Motors is still a young company and their strategy is to reinvest all cash made from a car model to be able to design a new car model. They began with the Roadster, and the profits from that model was used to design Model S, and the profits from Model S will be used to create Model X. The profits from both Model S and Model X will be used to create Model III. They have strong franchises and thus freedom to raise prices. The key to a good business is its business franchise - the extent to which it is surrounded by a so called moat. To test if a company is surrounded by a moat, you can ask yourself: "Can I compete with this company if I have $1 billion?" Or as Buffett said: "If you said, 'Go take the Wall Street Journal apart,' I would hand you back the billion dollars. The real test of a business is how much damage a competitor can do, even if he is stupid about returns." This is why Buffett invested in Coca Cola - you can't take $1 billion, build a company, and take a substantial market share from Coca Cola. Buffett said no-one could do it even with $100 billion. So can a competitor take $1 billion and compete with Tesla? The answer today is yes. Tesla can't raise prices because people will then buy gasoline cars or other electric cars. You have to remember that Tesla is a young company and young companies tend to not have any moats. But if Tesla builds more Superchargers and they become the standard charger for all electric cars, then that is a moat. Or maybe if they design so good battery packs that all other car manufacturers are buying them, then that is a moat. They don't take a genius to run. Compared with a company like Coca Cola, Tesla design and manufacture electric cars which is more complicated. Their earnings are predictable. They should be so predictable that you would be happy with owning the company even if the stock exchange closed down for the next ten years. Coca Cola has produced the same basic beverage for more than 120 years. Tesla's earnings are not predictable as the company is young and there are still many question marks. How many cars will Tesla build in ten years? No one will know for sure. Will we still use batteries in ten years - or will we use fuel cells which Tesla has dismissed? Maybe we find a large oil source or discover a way to "manufacture" oil? They are not natural targets of regulation. Tesla is not selling cars through a traditional dealership - they are using their own stores and the Internet. How you sell cars is regulated in some US states. In some US states, it's not legal to sell cars through anything else than a dealership that's not owned by the car manufacturer. They have low inventories and high turnover. Tesla is only building cars as the customers have ordered them - except for the few cars they need for display purposes in the stores and galleries. Their factories are also using Japanese manufacturing technologies to minimize inventory. But there's a resale value guarantee that 5 200 Model S buyers used in 2013 (about 40 percent of all US customers). If the value of a Model S decreases, then these customers will send back their cars to Tesla. The management is owner-oriented. The CEO Elon Musk earns no salary. But he has performance based options he can make money from if certain milestones are met. One milestone is met when Model X is finished. So these milestones are not related to the performance of the stock - and that's a good thing according to Buffett. Elon Musk invested in Tesla because he believes that the world is running out of oil and this is something he really cares about. He invested in the company SolarCity that installs solar panels because he needed to power the cars with clean energy. So he want Tesla to succeed and is not working just to make a large CEO salary. 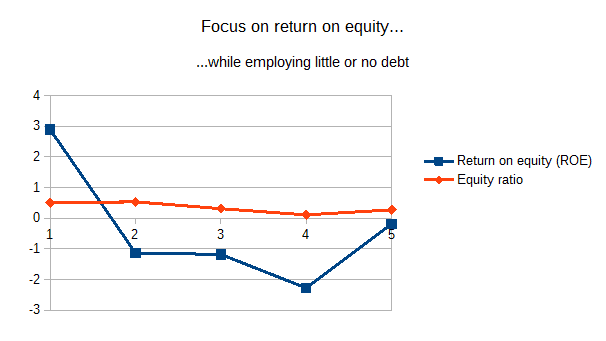 Focus on return on equity - not earnings per share. A business should achieve good returns on equity while employing little or no debt. A good return on equity is maybe 20 percent, but Tesla's return on equity is -18 percent. But Tesla's return on equity has improved if you look at the overall trend. Calculate owner earnings to get a true reflection of value. Owner earnings are basically the cash flow from operating activities minus the capital expenditures. The latter is how much of the year's earnings must the company use for new equipment, plant upgrades, and other improvements to maintain its economic position and unit volume. As Tesla is still growing very fast, the capital expenditure is still large. For example, they need cash to build the Gigafactory, so owner earnings are today basically zero. 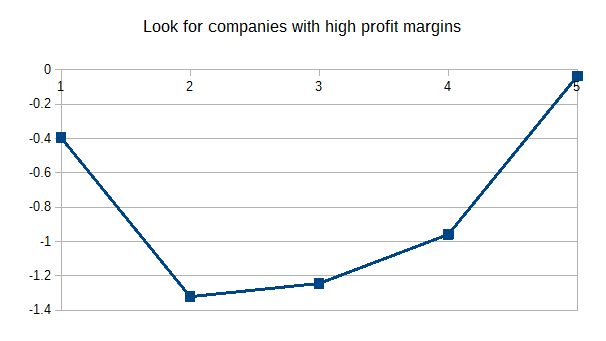 Look for companies with high profit margins. To get a sense of what high profit margins are, Buffett invested in Coca Cola when the profit margin was 19 percent. Tesla's profit margin is still negative but has improved if you look at the overall trend. For every dollar retained, has the company created at least a dollar of market value? The basic idea behind this metric is to test if a company uses the profits in an optimal way. If for every dollar retained, the market value hasn't increased with that amount, maybe it would have been a better idea to give that money to the shareholders in form of buying back stock or as a dividend. You can't apply this thinking to Tesla. They reinvested the cash from the first car, the Roadster, to create the Model S. What if this metric said it would have been a better idea to give away all money from the Roadster to the shareholders instead of making the Model S? To properly value a business, you should ideally take all the flows of money that will be distributed between now and judgment day and discount them at an appropriate discount rate. That's what valuing a business is all about. Part of the equation is how confident you can be about those cash flows occurring. Some businesses are easier to predict than others. We try to look at businesses that are predictable. So can we predict Tesla's future cash flows? Buffett said he doesn't have a clue how to estimate Microsoft's future cash flows. Estimating Tesla's future cash flows is also difficult. The company has said they will deliver 500 000 cars in 2020. But how many will they deliver in 2025? How much money will they make from Powertrain Components and Stationary Energy Storage Applications in 2018? Will they have enough materials to build batteries for all electric cars in 2023? There's a lot of lithium available, but only if the price of lithium increases. What happens if the resale value guarantee backfires in 2021? We can try to make a very rough prediction of Tesla's future primarily based on how many cars they will sell in the future. Based on this prediction, Tesla's market value should be $69 billion. But are we confident that those cash flows will occur? The answer is no! We are not confident that Tesla will make 760 000 cars in 2023, while their production in 2013 was 23 000 cars.